This volume comprises articles that examine the contribution of women saints from India and abroad as well. 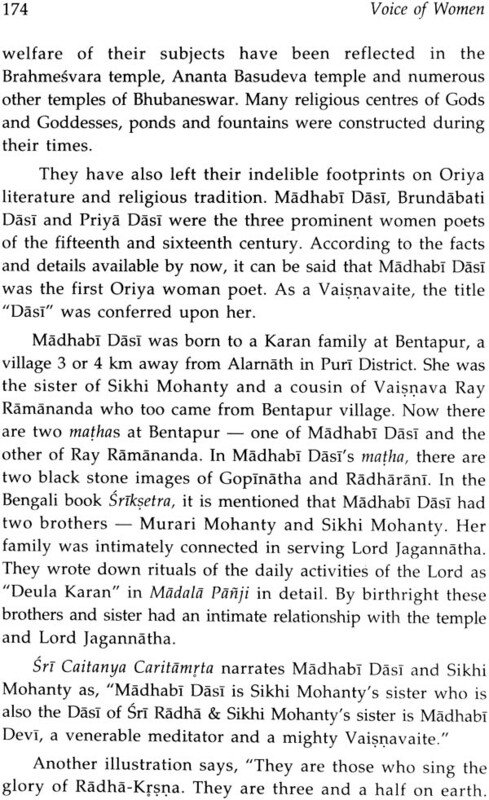 The articles discuss the origin of bhakti/ saint poetesses like Rsika Gargi, theris, Andal, Lal Deb, Akka Mahadevi, Mirabai, Gangasati, Tarigonda Vengamamba, Janabai, Bahinabai, Madhabi Dasi, Hildegard of Bingen, and Julian of Norwich from different regions and religions. 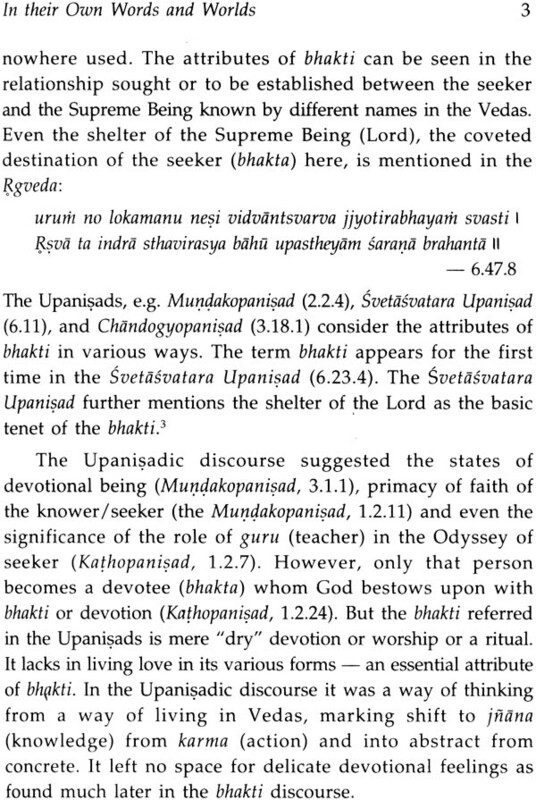 Their contribution constitutes a rich tradition of devotional discourse in terms of from as well as content and has survived till now in folk and learned traditions. The articles discuss their voice, visions and sufferings  physical and psychological  and also the way they transcended them and voiced them in their compositions. Their uniqueness lies in their existence at multiple at multiple levels  social, poetic, religious and spiritual  among others. The volume would interest literary, cultural, historians and religious scholars as well as general readers. Avadhesh Kumar Singh is Vice Chancellor, Dr. Babasaheb Ambedkar open University since August 1, 2006. Prior to the present assignment, he was Professor and Head, Dept. of English and Comparative Literary Studies, Saurashtra University, Rajkot. The areas of his interest include Indian and Western literature and translation studies on which he has published 12 books and more than 100 papers in various Journals and anthologies of academic repute. Indian Knowledge Systems (2005) in two volumes (with Prof. Kapil Kapoor), Discourse of Resistance in the Colonial Period (2005), Ramayana Through the Age: Ramakatha in different Versions (2007) are among his publications. Also he has delivered Keynote Addresses to many national and international seminars. He is the Editor of Critical, a journal of literary and critical studies since 1994. 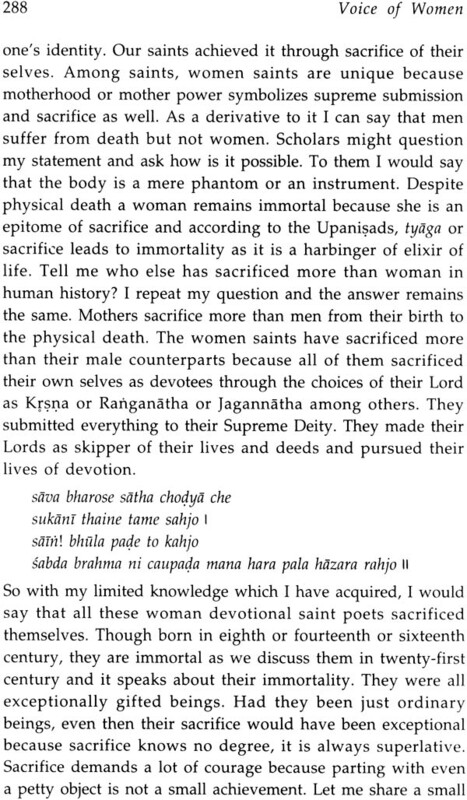 It would be proper on my part to deal with the genesis of the present volume Voice of Women  Gargi to Gangasati. At the Ramayana Conference, held at Kailash Dham Gurukul, Mahua in 2006, Dr. Aruna Dhere, one of the participants whose papers have been published as Ramayana Through the Age: Ramayana in Different Versions (2007), suggested that female saints in India deserved a serious discussion in the present context. The idea was further explored with Pujya Shri Morari Bapu who liked the concept and named it "From Gargi to Gangasati." 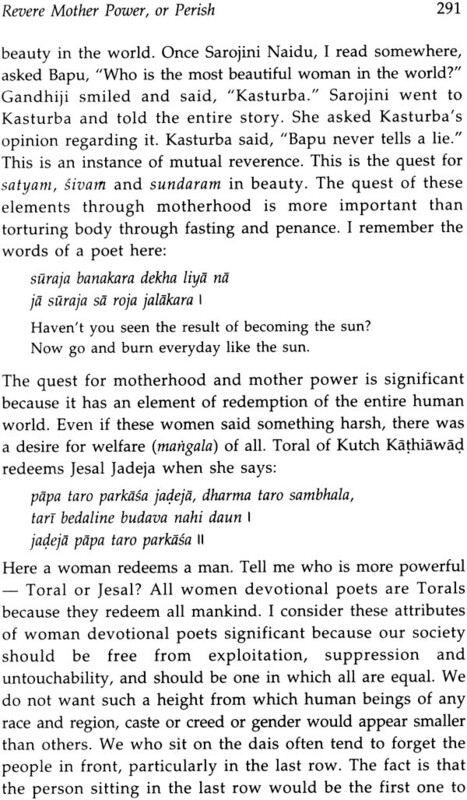 Since he did not want it to have limiting connotations, if any, the title Voice of Women was finalized with the blessings of Bapu without dropping concept  that become the subtitle of the book. With the blessings of Bapu, a small committee was formed and Shri Girdharibhai Rohra, Smt. Sindhu Mehta-Chandel and Shri Nagindas Sanghavi were requested to work for the committee. The seed sprouted into a sapling. Bapu's blessings watered and sheltered it, became a plant. Consequently all endeavours were directed at transforming the concept into a creative conference in order to capture voice and vision of some of the great poetesses of India and even beyond. The members of the committee various scholars who consented graciously to submit papers for the conference. 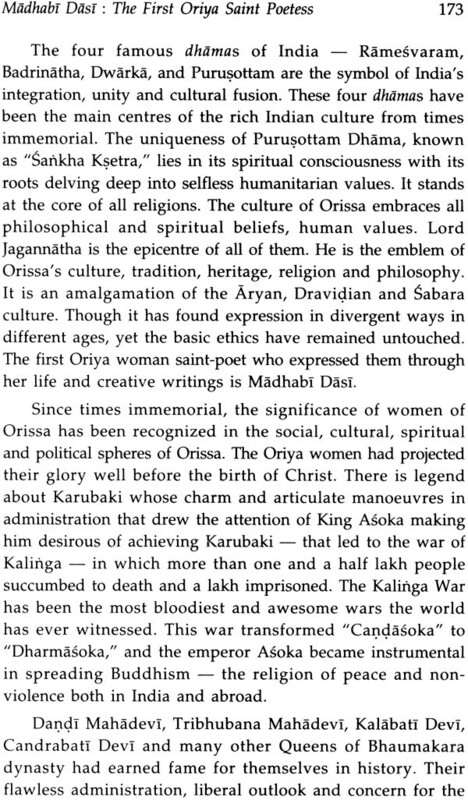 Bapu insisted that Rabia Basri must be one of the saints discussed, and Mrs. Pam Atikins of the USA suggested the name of Hildegard from Europe. 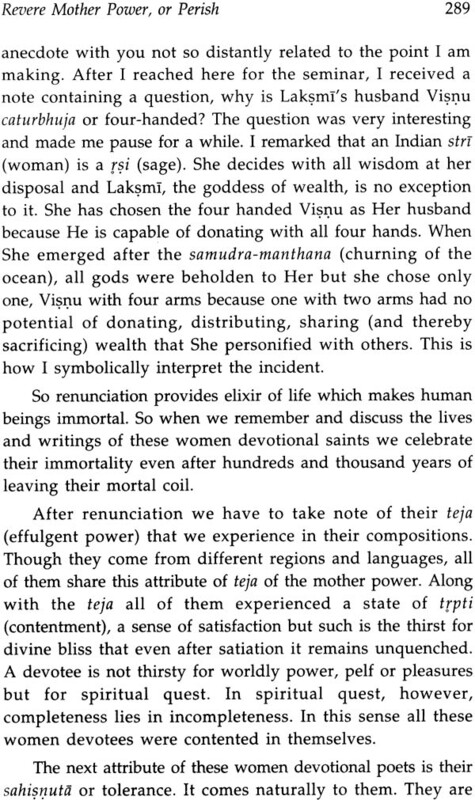 Since most the female saints were themselves great poetesses took, their words and rhythm deserved to be presented to the audience. A well-known music composer Shri Uday Mazoomdar was approached by the Committee and he enthusiastically picked up the idea and organized the musical rendering of the poetic creations of the saints. 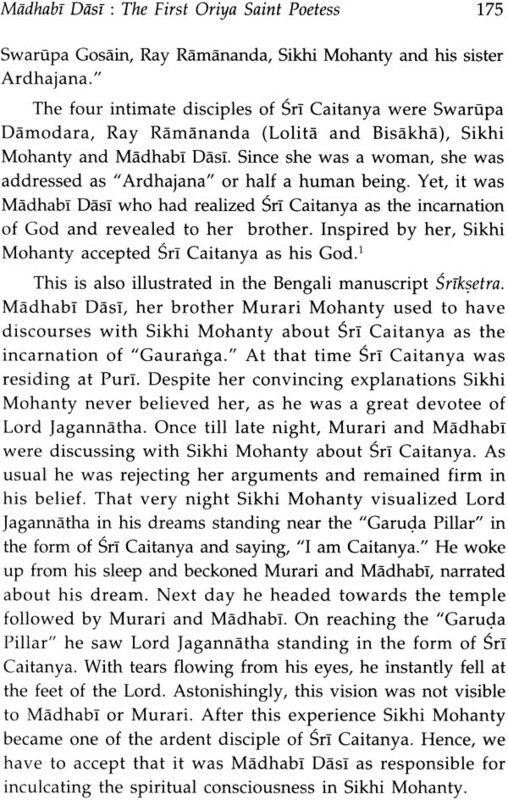 Each scholar was requested to restrict him/herself to 45 minutes and their presentations were followed by the singing of the padas, bhajanas, vacanas or vyakhyanas of the saints selected by the concerned scholars. In order to make the audience enjoy the musical better, the poems were translated and presented either in English or in Hindi. Sri Girdharibhai Rohra, Smt. Sindhu Mehta and Sri Nagindas Sanghavi asked me to consider the possibility of giving a CD of the musical rendering along with the printed book. According to their wish I sounded Sri Susheel Mittal, D.K. Printworld, who immediately agreed with the suggestion. The remaining part of the story needs no narration. It is in your hands. The present endeavour demands acknowledgement of gratitude to all those who contributed in various ways. I relied heavily on the guidance and help of Sri Nagindas Sanghavi, Sri Girdharibhai Rohra and Smt. Sindhu Mehta Chandel in receiving the manuscript from different author and for encouragement was a source of confidence for me. 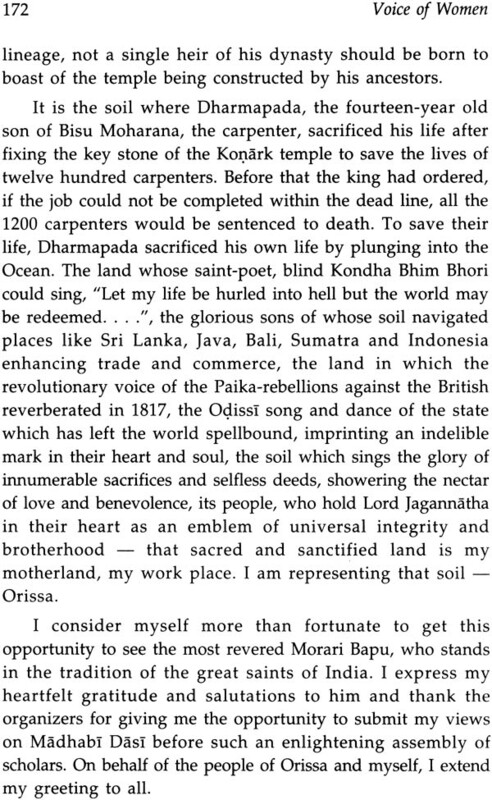 Sri Harishchadrabhai Joshi, as ever, evinced keen interest in the publication, which I value more than anything else. I must conclude the prefatory note with a personal statement, for the experience of participating in the process of editing a volume like this makes one philosophical and ask a complex question unpretentiously: what is life? Life is nothing but a series of experiences. The quality of life depends on the on the quality of experience that rest solely on the people and configuration of circumstances around the concerned person. If the configuration is favourable, we tern it as goods fortune. Life become a seedbed of strangeness, if configuration obfuscates our understanding. However, even a slight touch of a noble soul at times transforms the configuration of circumstances. One at times achieves something disproportionate to one's efforts. 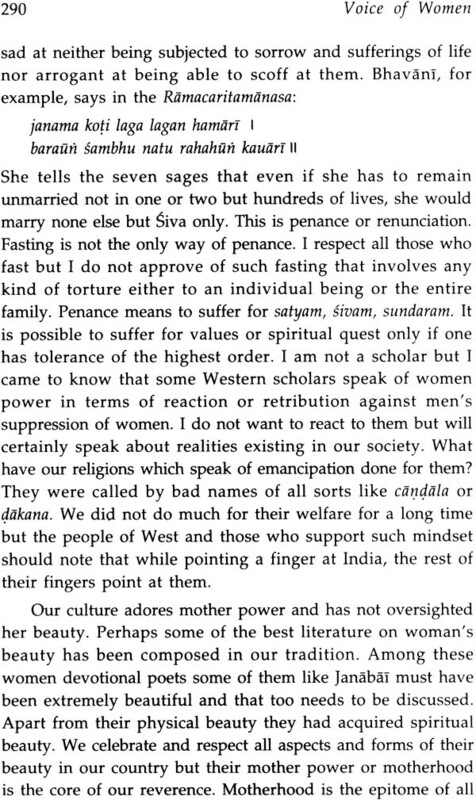 The volume like Voice of Women : Gargi to Gangasati is a consequence of configuration made favourable by a faint glance that brings credit should go to the members of the committee, distinguished scholar who submitted their valuable papers and translators Maulik Vyas, Meenakshi Sivaram, Sanjay Mukherjee and Gopika Jadeja who squeezed time from their busy schedule for us. I attribute the merits of the volume to all of them. 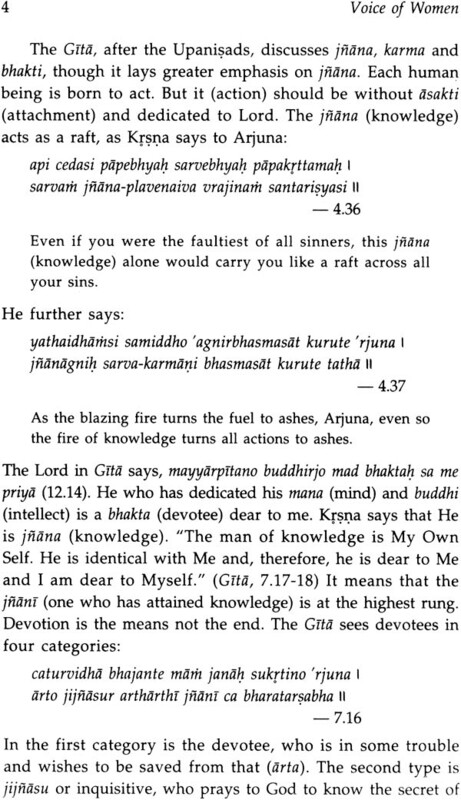 The faults, however, are all mine, and I get immense pleasure in indulging in them, for in some way they help me in learning from the process of standing behind a humanist, cultural saviour and above all a social reformer in particular, for it is easy to be a spiritualist but difficult to be a social reformer, for the latter path is fraught with dangers of all sorts. 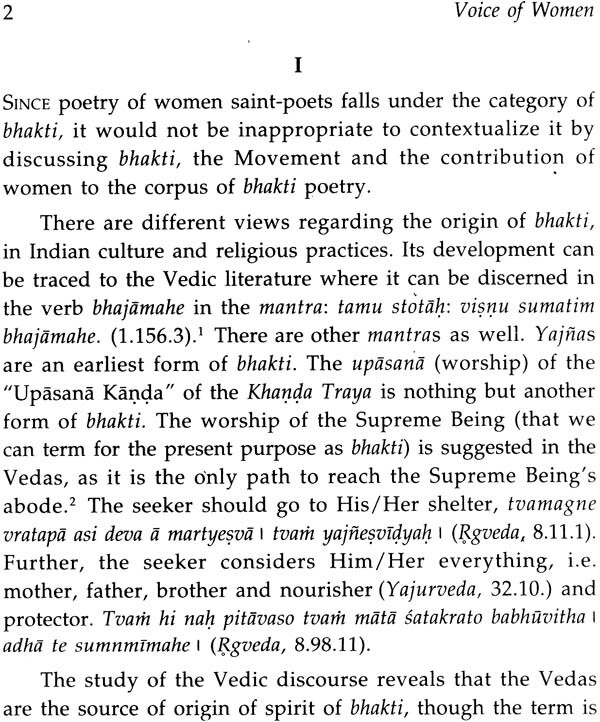 It is hoped that the present book would encourage re-consideration of the poetesses, their voice and visions by which they transcended regional, religious and even gender specifities in as many diverse ways as they themselves, and thereby enable a new understanding of spiritual, cultural and literary aspects of devotional poetry of the women saints. May the gracious glance of Pujya Morari Bapu, the spirit behind the present endeavour, bless this volume and all of us who care and take pride in our cultural and spiritual heritage in particular, and the entire humanity in general!